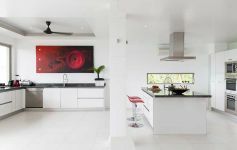 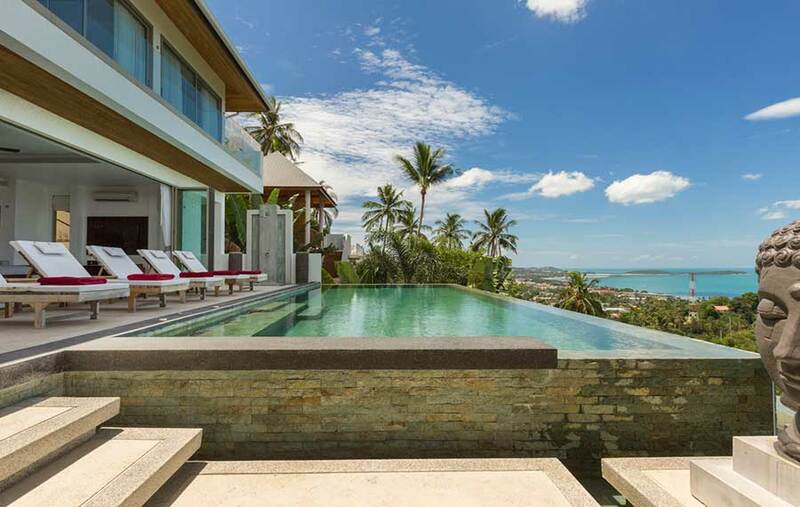 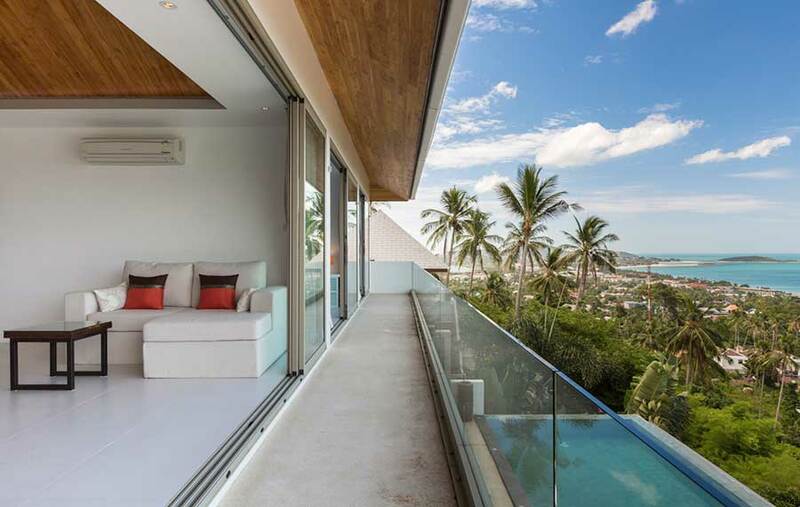 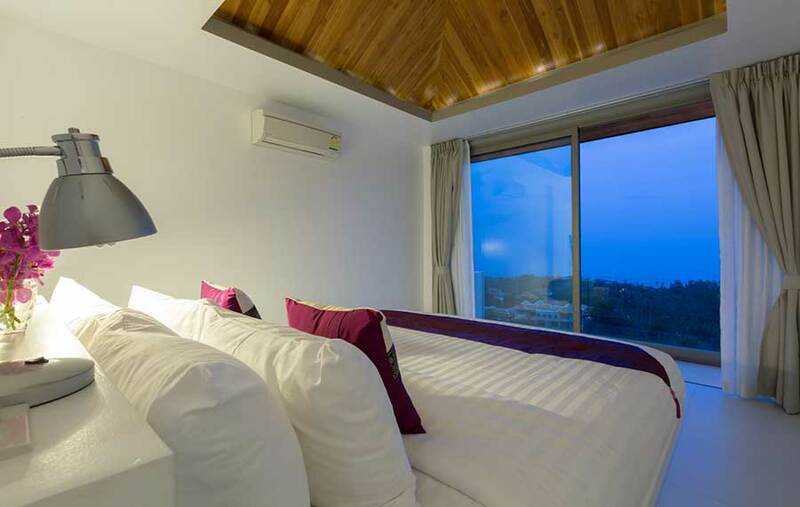 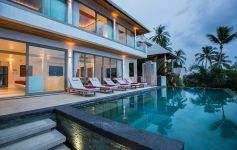 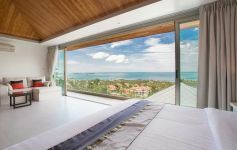 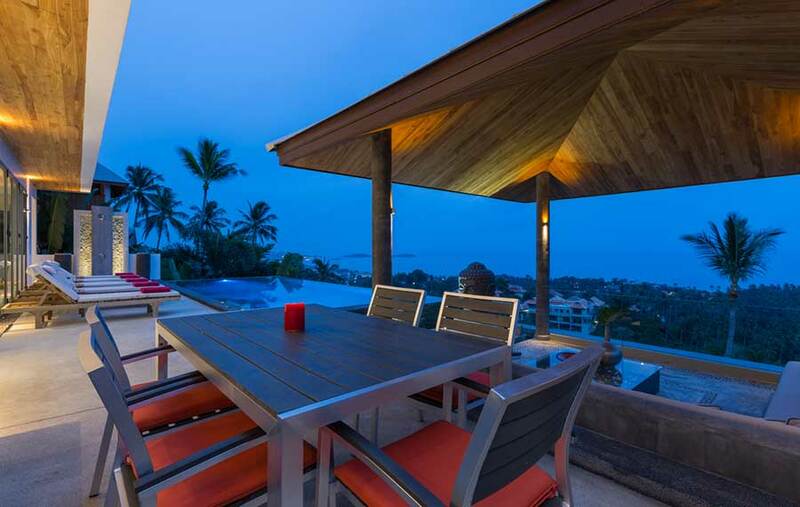 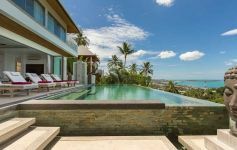 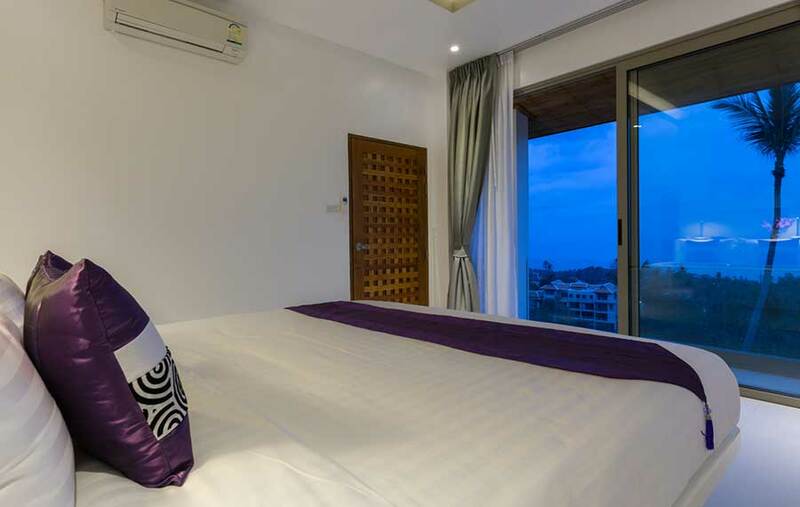 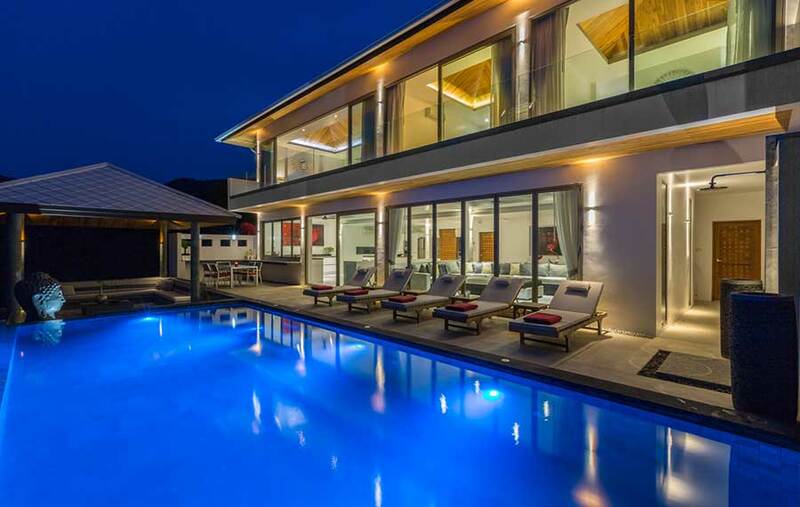 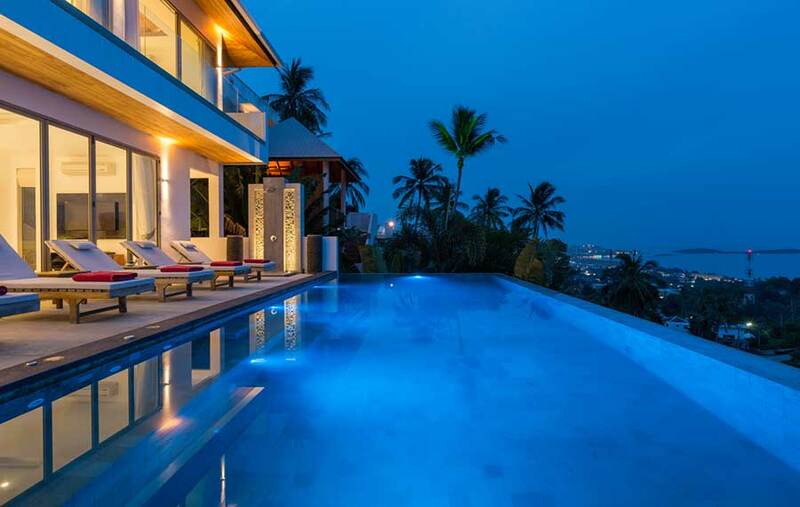 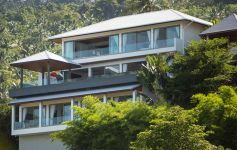 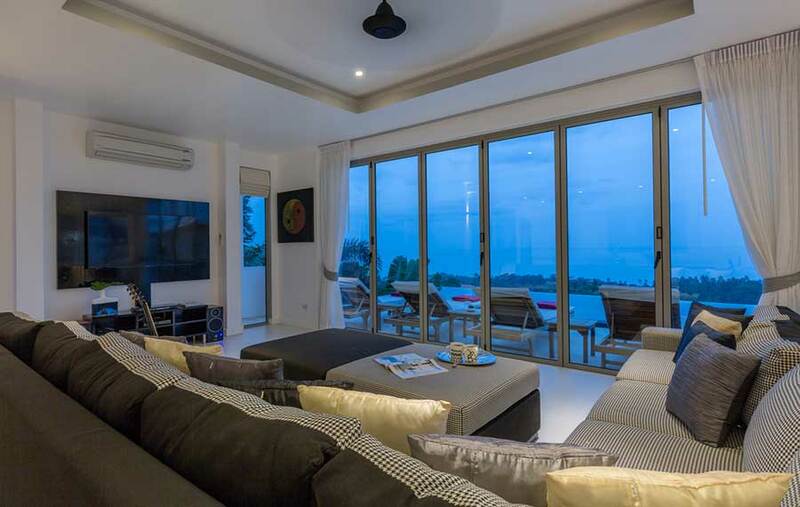 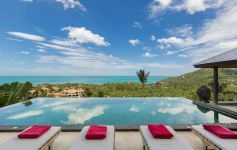 This stunning 6-bedroom holiday villa is nestled in the lush green hillside of Chaweng Noi offering breathtaking views of Chaweng Bay from all living areas of the property. 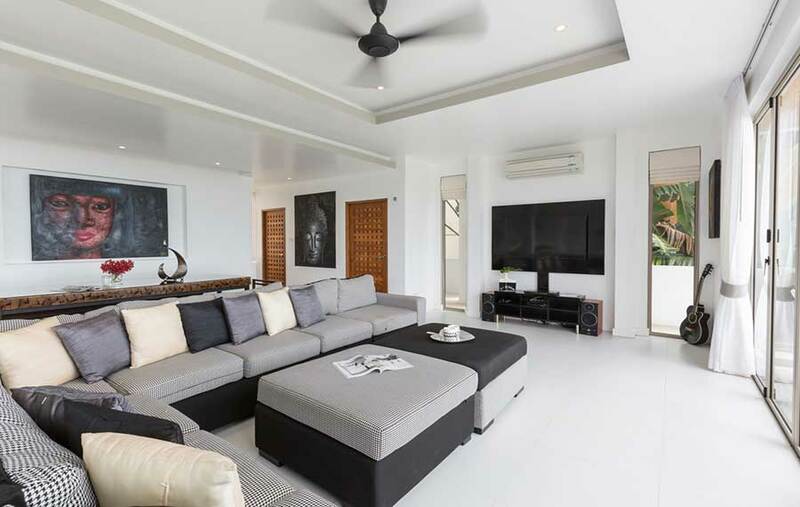 With an impressive 850 sqm of built up area, including an infinity-edge pool with 4 jacuzzi jets and a poolside sala surrounded by water canals, this deluxe holiday getaway offers a wealth of luxury indoor/outdoor living. 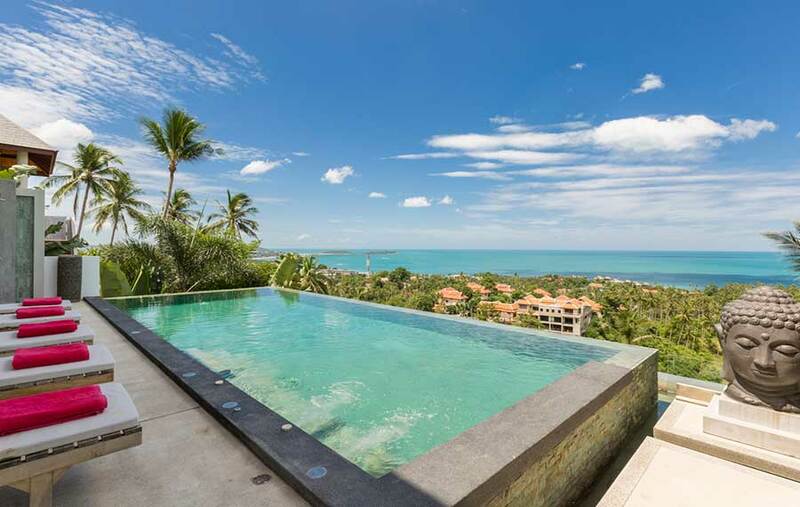 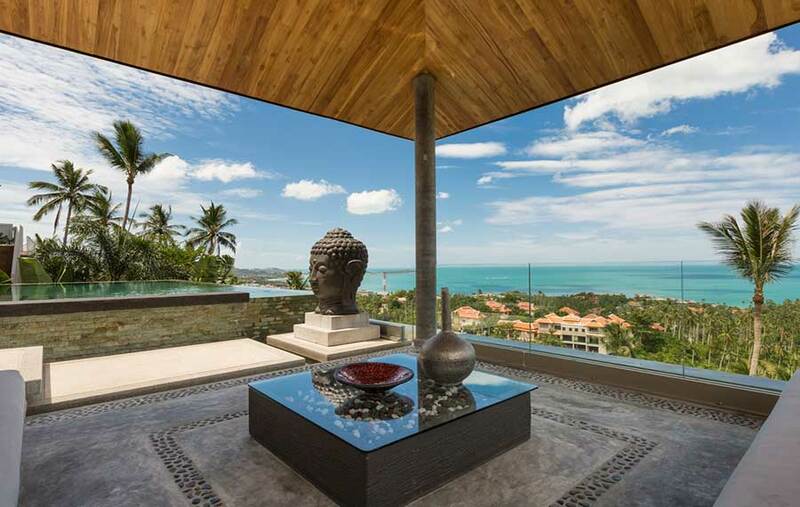 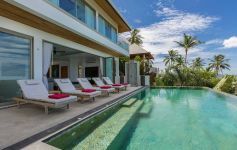 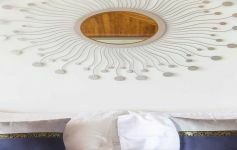 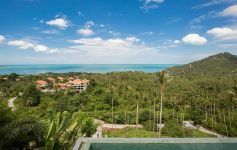 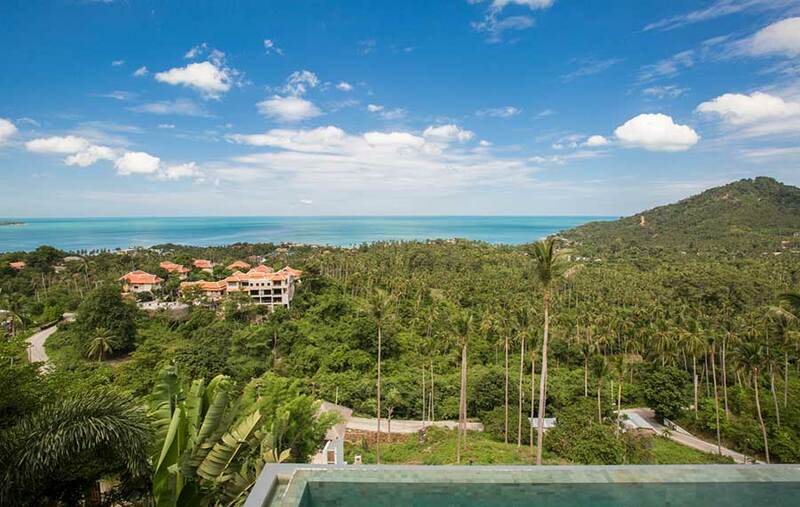 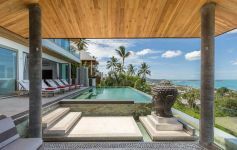 The location could not be better, the world-famous Chaweng Beach is just a few minutes drive away, Samui International Airport, the fine dining of Fisherman’s Village and most of the island’s amenities can all be reached within 15 minutes. 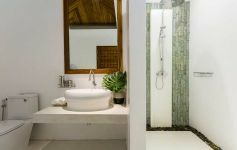 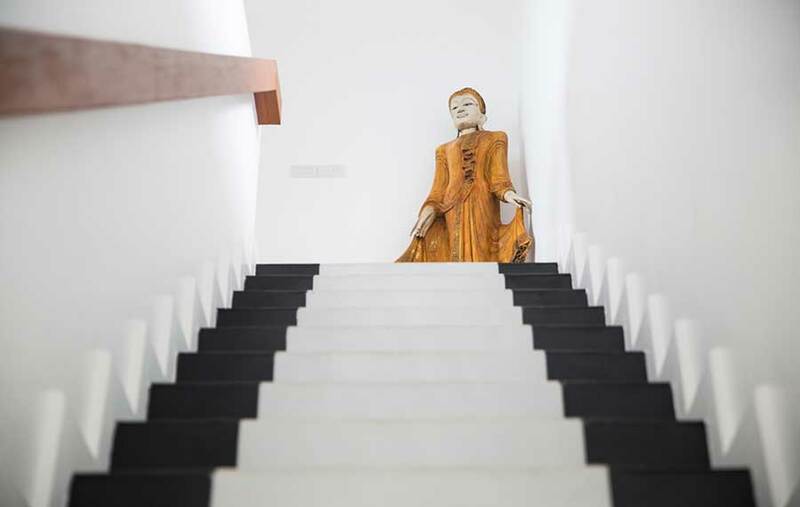 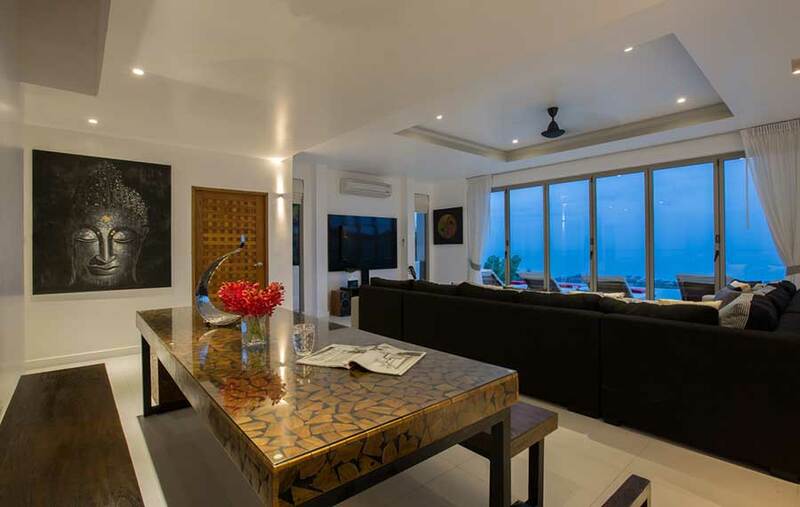 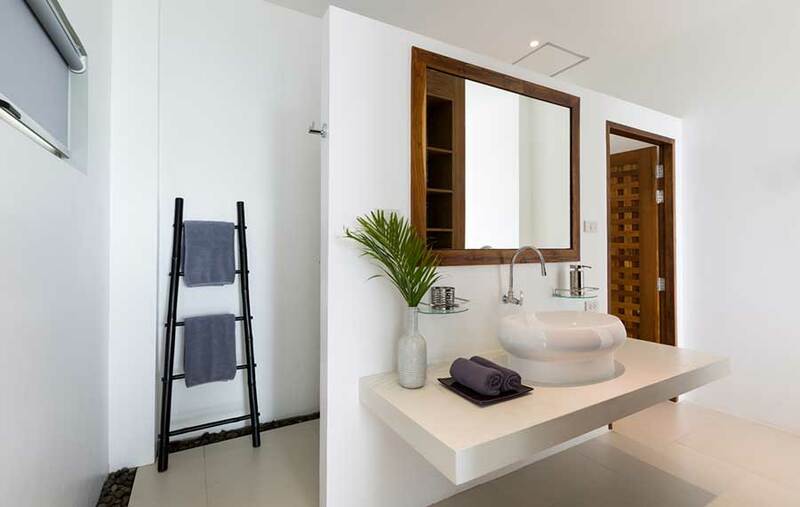 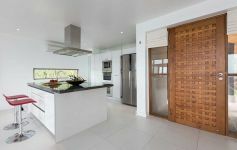 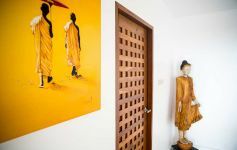 The villa is immaculately appointed and tastefully styled with minimalist contemporary Asian décor. Nearly all the rooms boast beautifully finished high-vaulted wooden ceilings. 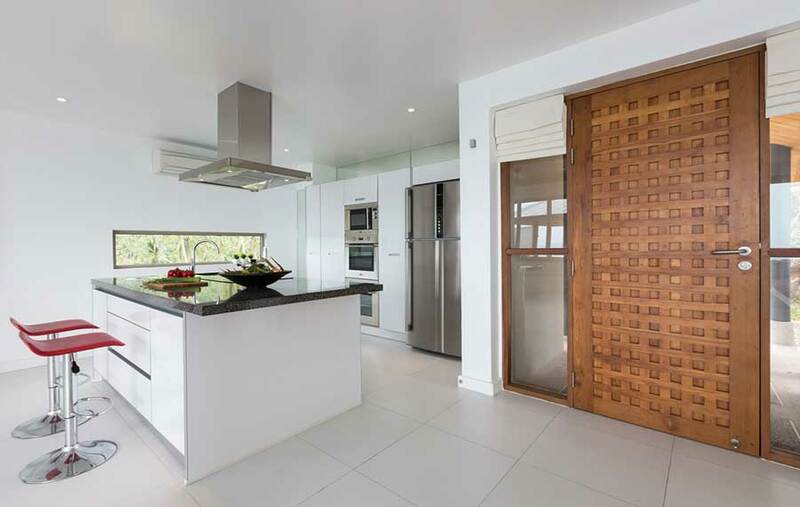 On the ground level is the open-plan lounge, gourmet kitchen and dining area. 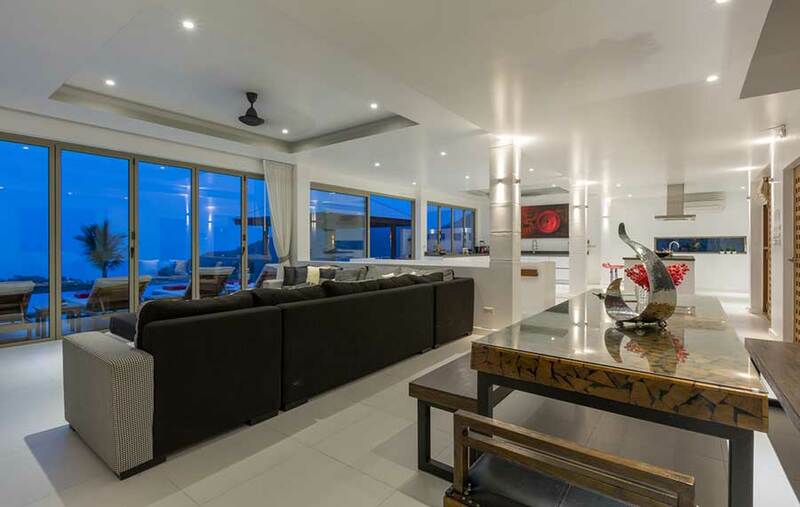 Sliding Sun Paradise windows spanning the full length of the lounge open onto the expansive sun terrace. 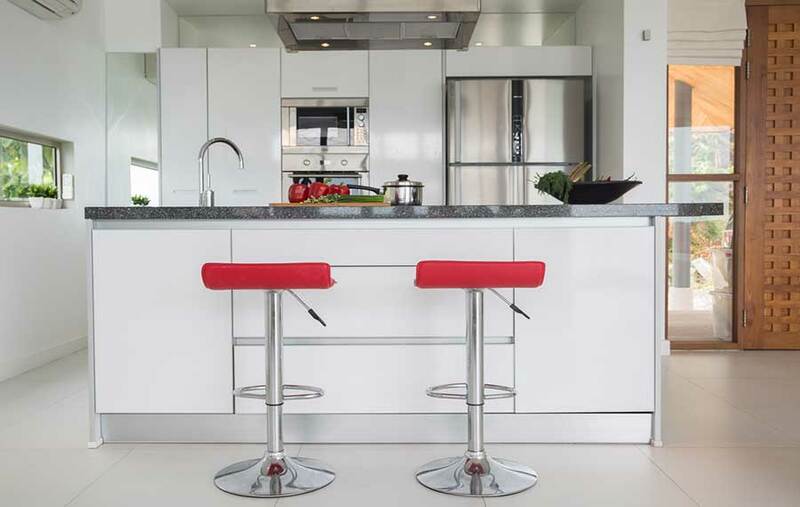 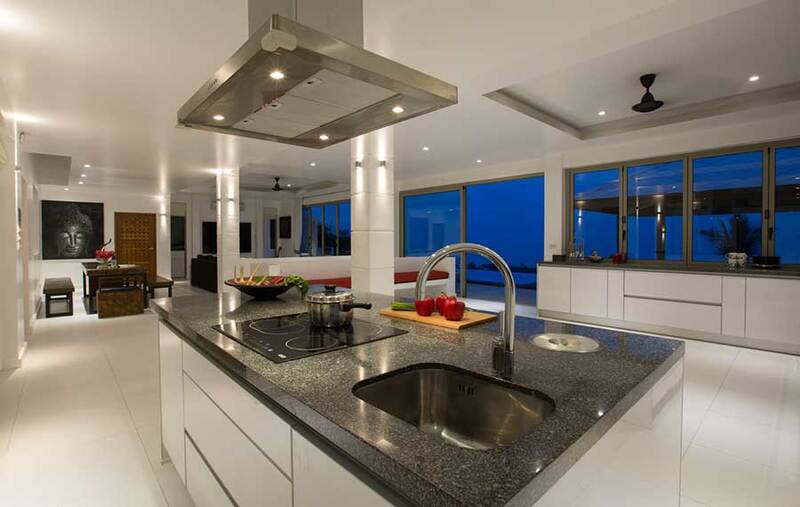 The spacious state-of-the-art kitchen features granite counters and cooking island. 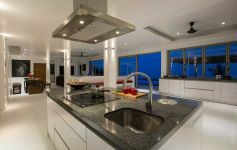 Its fully equipped including double oven, dishwasher and fitted microwave. 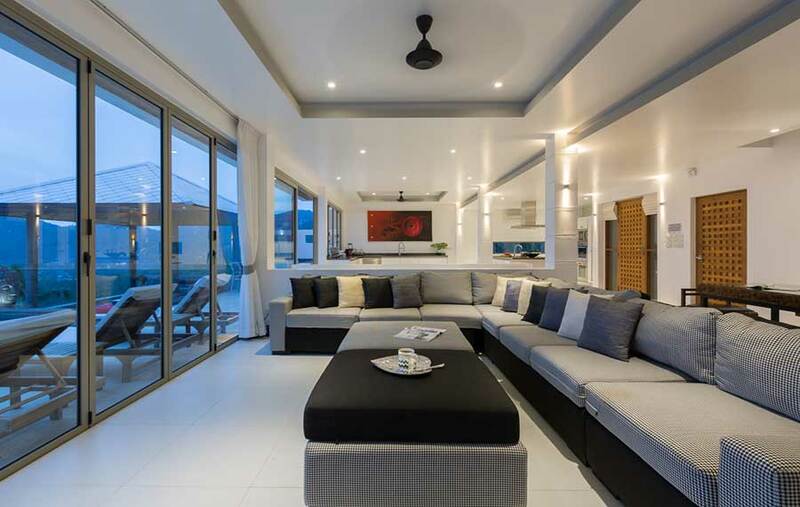 The lounge area includes a flat screen TV, satellite channels, internet and mobile WIFI sound system. 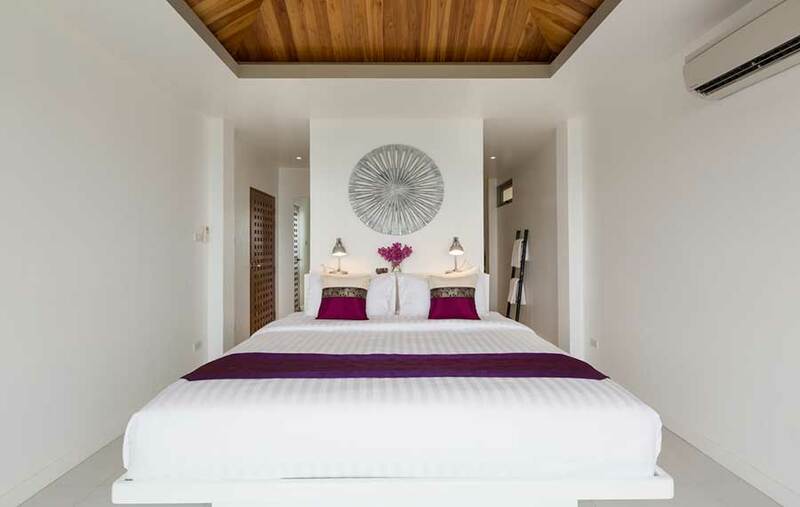 On the top level, you will find the deluxe master suite and the second and third bedrooms. 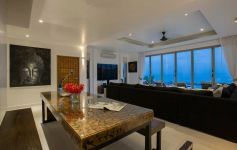 All three bedrooms have luxury ensuite bathrooms and their own ocean view balconies. Bedrooms four, five and six, all with ensuite bathrooms, are on the lower ground floor along with the spacious games room with a pool table. 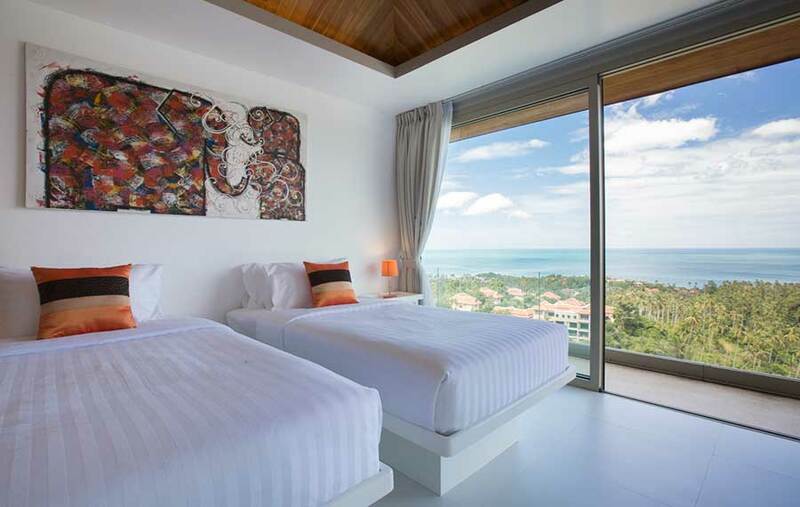 Bedrooms four and five also each feature a private sea view balcony. 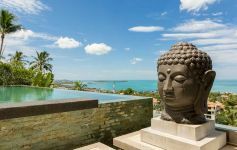 Outside, the turquoise infinity-edge pool and adjacent sala are framed by water canals with mood lighting that illuminates the Buddha's head bringing a deep feeling of tranquillity. Between the pool and the villa, there is ample sun terracing affording spectacular views of Chaweng Bay. 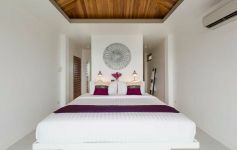 Nightly rates range from 650 to 1,500 USD depending on the season. See Villa Rates tab for full details. 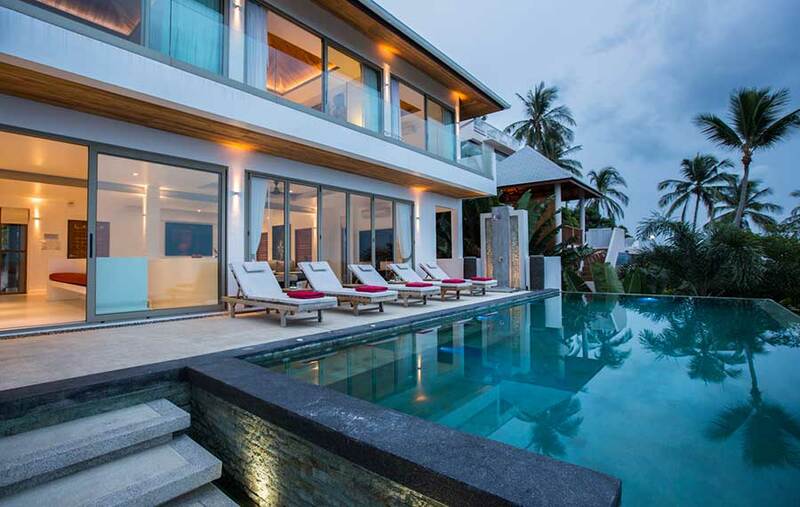 This is a self catering Villa. 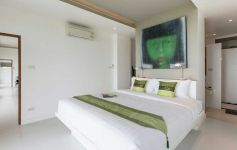 Rates quoted are for up to 6 people and a surcharge of 50 USD is applicable for each extra person. 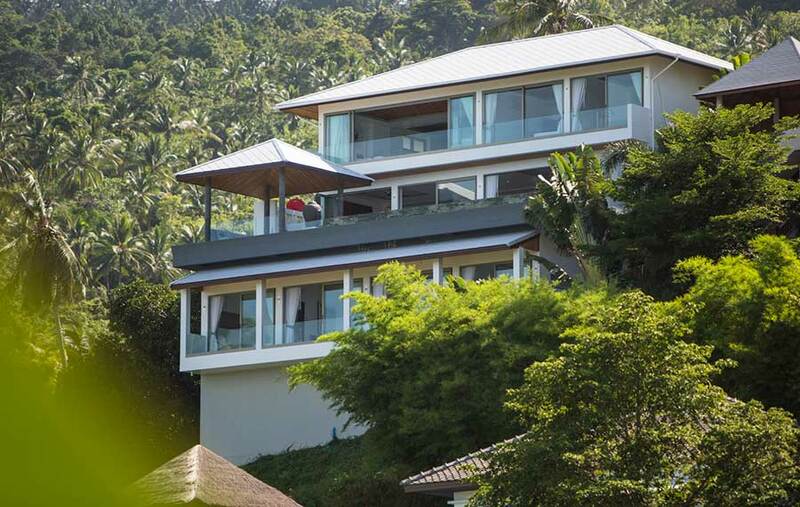 The Villa sleeps up to 12 people Plus 2 extra kids. A refundable damage deposit of 1,000 USD is required. 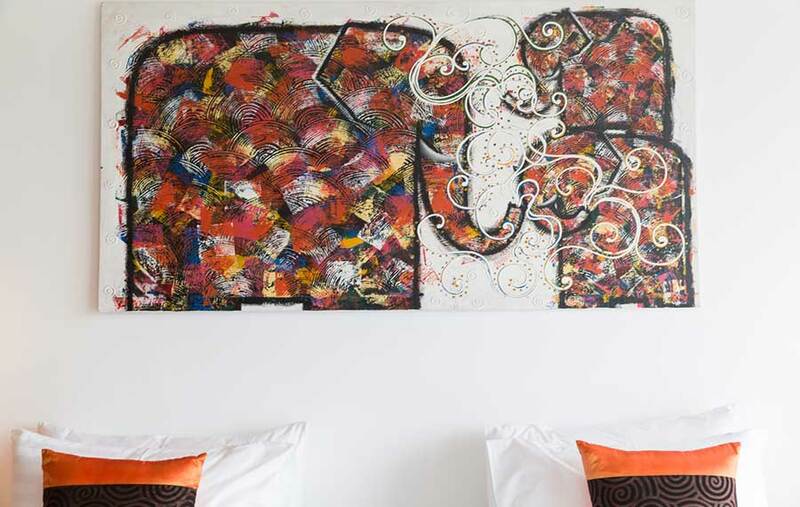 Deposit is paid to the concierge at check in and refunded to the guest at check out. 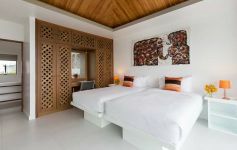 Daily maid service, cleaning, linen change and bed making. Welcome Pack, fruit, drinks and basic supplies upon arrival. 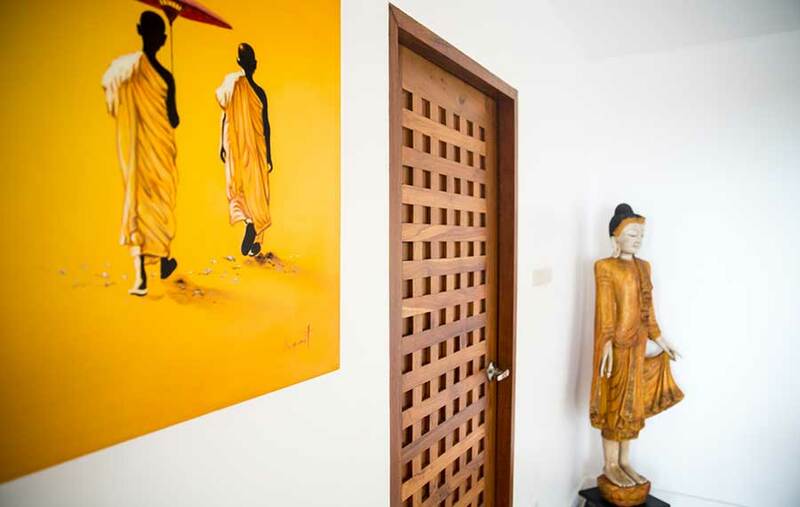 Access to our concierge to help with tours, transport and to assist the guests. 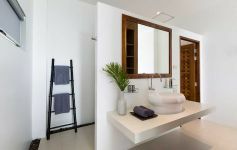 *There are no hidden costs - tax & service included.